A thorough study of the original text of the Yijing should also involve an examination of the variant texts that exist of this classic. It would be a fallacy to think that the Book of Changes never changed; through archaeological excavations we now know that the text of the Yi was not as fixed as many want us to believe. Especially before the Qin dynasty, but also during the Han dynasty, there we versions of the Yijing that are different on many points from the version that we use today. The received version is only a compromise of different schools, it should never be seen as the Yijing, it is just one version of the book. To get a better picture of the Yijing and its language through the ages it is necessary to study the different variant texts alongside with the received text. The first variant text that got worldwide attention was the Mawangdui text of the Yijing that was discovered in 1973. A text which was found 4 years later is seldom mentioned, mainly because of its fragmented state and late publication of these fragments: the Fuyang bamboo slips. In 1993 the Shanghai Museum bought an amount of bamboo slips on a market in Hong Kong, among it was a portion of the Zhouyi. Through the ages fragments are found of the Xiping Stone Classics Zhouyi from the Han dynasty. 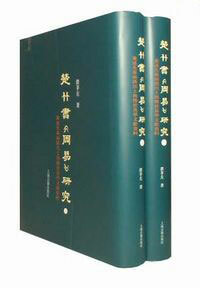 The best book for the study of the Shanghai Museum Manuscript has been 上海博物館藏戰國楚竹, Vol. 3, ISBN 7532530140. It is a magnificent book, in the best quality possible. The only downside was its size: 44 x 30 cm is not something you carry easily with you. 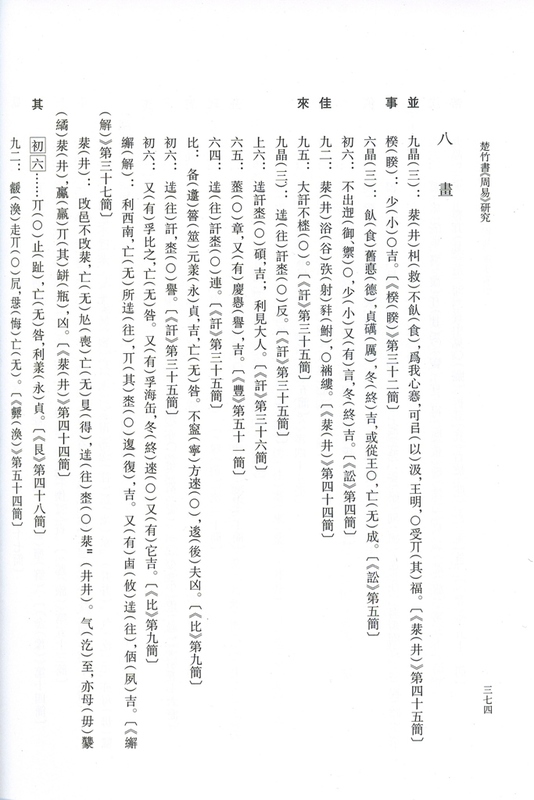 But this has changed since the publication of 楚竹書《周易》研究 by 濮茅左 Pu Maozuo last year. It has the size of a large dictionary, is published in two volumes containing a total of 1045 pages, and compared to the 上海博物館藏戰國楚竹, Vol. 3 a huge amount of extraordinary material has been added. If you want to study the variant texts of the Yijing, then this is the book to have. It contains transcripts of all variant texts I mentioned, and a lot more. Below is the contents of the book, with notes and images to explain some sections. 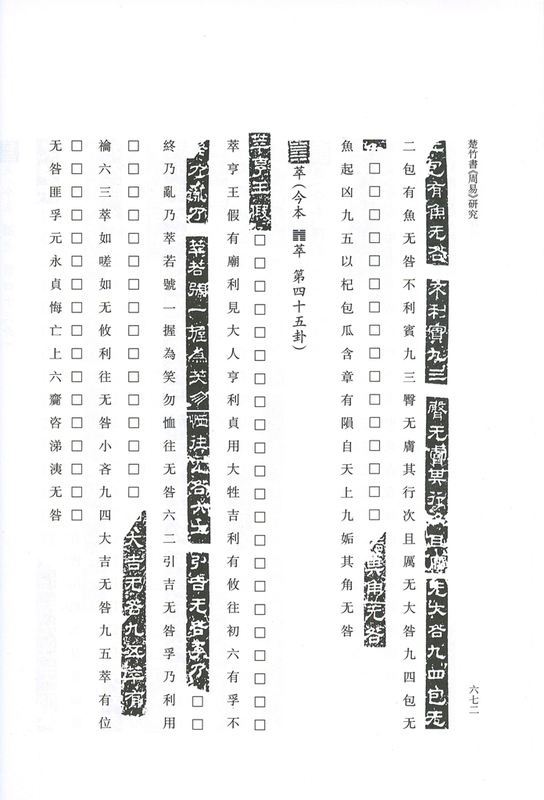 The first section of volume 1 contains full-color images of the bamboo slips, along with a transcription in modern characters. The first volume deals in detail with the Shanghai Museum Manuscript. Introduction. About the 《上海博物館藏戰國楚竹書》 series and its contents, importance of the Chu Bamboo Yijing and other Chu bamboo books (《太一生水》, 《緇衣》, 《魯穆公問于子思》, 《五行》, etc.) found in recent years. A short biography of the life and work of Ma Chengyuan 馬承源 (1927-2004), director of the Shanghai Musem, who acquired the bamboo slips which were found at a Hong Kong market in the spring of 1994. See also here and the obituary in Early China 29 (2004). This part also gives an account of the publications and research since the discovery. 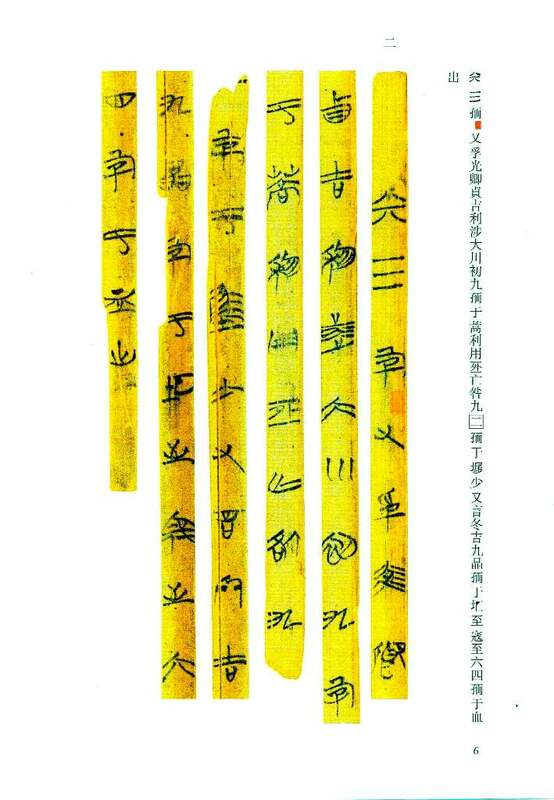 About the name of the document, 'Chu Bamboo slips Zhou Yi', as well as the history of bamboo documents in general. About the meaning of the coloured markings at the beginning and end of certain hexagram texts. In the conclusion it is assumed that the markings refer to a separation of the Zhou Yi into two halves, just as the received version, but with different hexagrams in each half. About the language of the document, often used characters, loan characters, different forms of one character, etc. A detailed account of every bamboo slip, it's condition, size, and contents. A transcript in modern characters, with punctuation and substituted loan characters added. 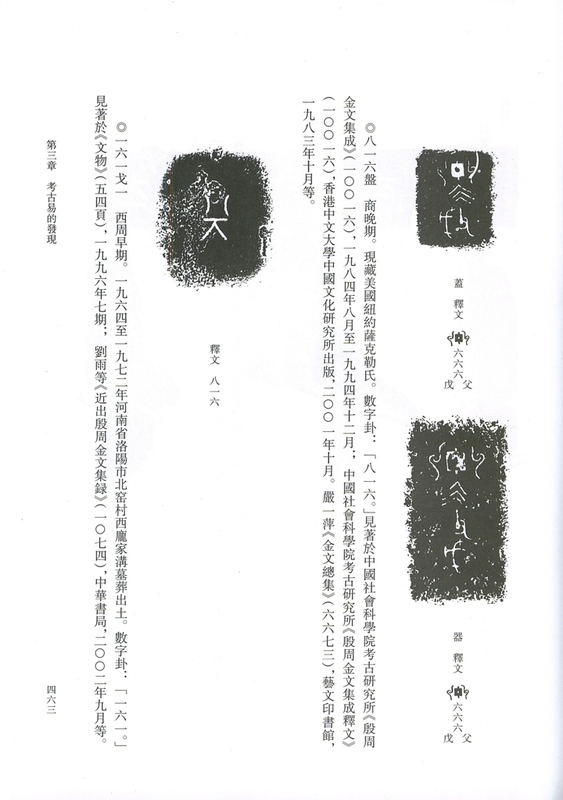 Comparison of the bamboo text, the Mawangdui text and the received text (see here). 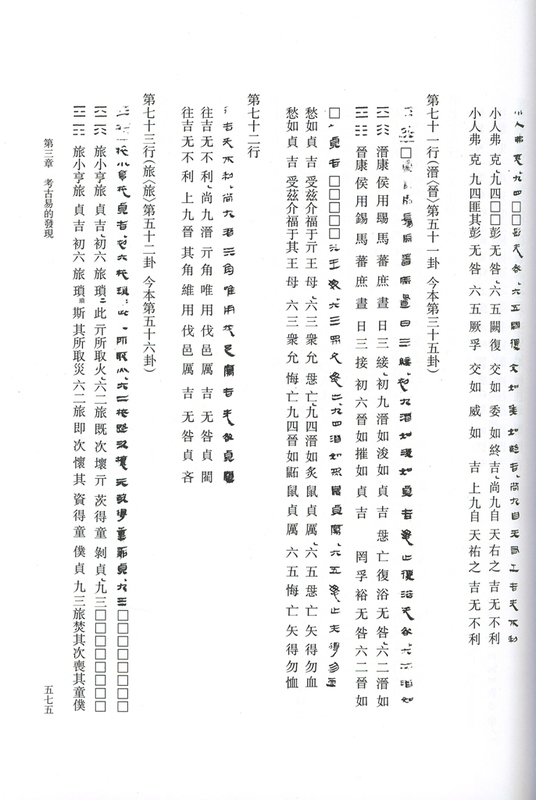 An index with explanation of certain phrases used in this book and in the Chu Bamboo Zhouyi, like 又孚才道, 小子礪又言，etc., arranged by stroke count of the first character. 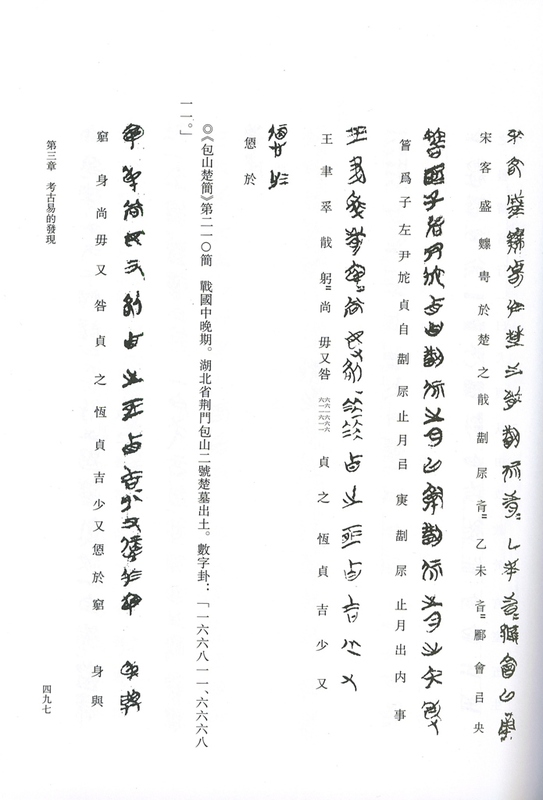 A concordance of the characters in the Chu Bamboo Zhouyi, arranged by stroke count. 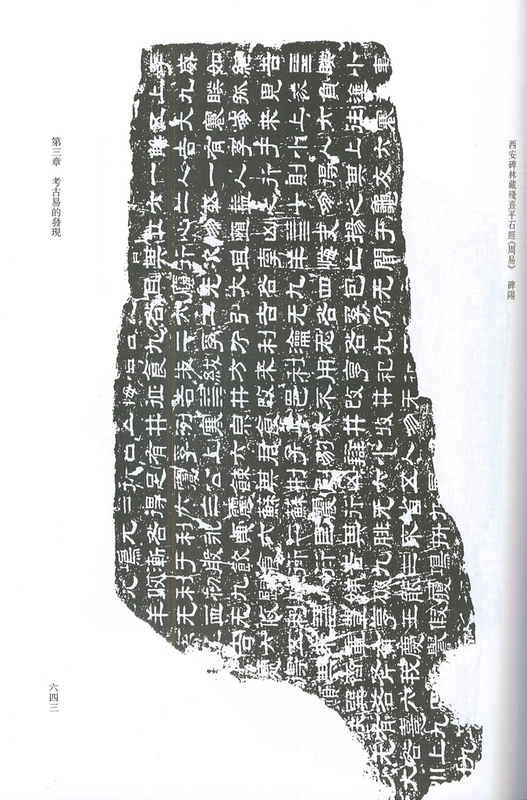 This chapter deals with references to the Zhouyi and its components as found on oracle bonze, bronzes inscriptions and other pre-Qin and Han dynasty texts. 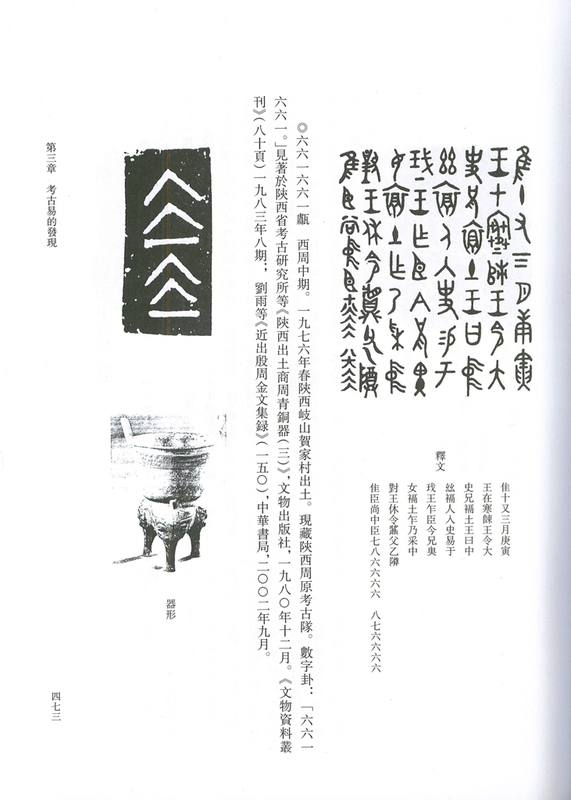 Part one talks about the character yao 爻 ('hexagram line') on oracle bones, the bagua numerals as discussed by Zhang Zhenglang in his provocative article 'An Interpretation of the Divinatory Inscriptions on Early Chou Bronzes.' Early China 6 (1980â€“81), pp 80â€“96; (see also Stephen L. Field, Who Told the Fortunes? 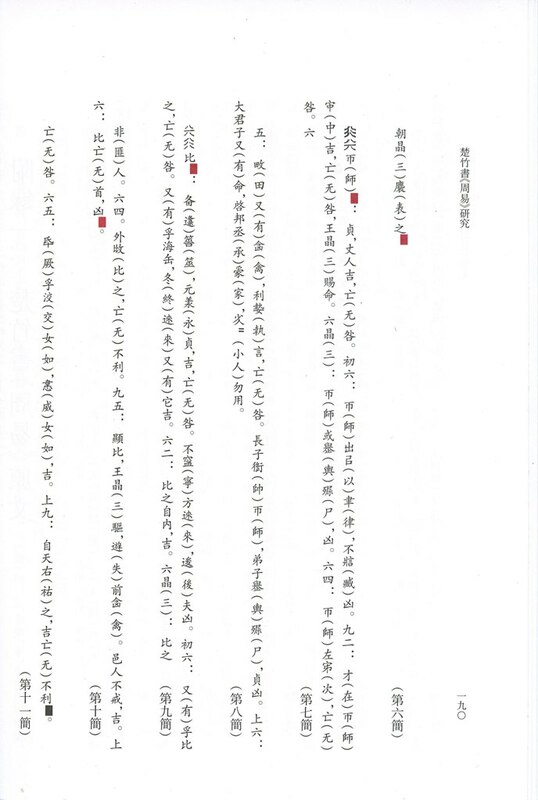 The Speaker in Early Chinese Divination Records, Asia Major 2000 ( and Li Zongkun 李宗焜, 數字卦的內容與疾病記述). Examples with lots of pictures. This part also discusses the character yao 爻 and the numerals, as found on bronze inscriptions. Objects like stone utensils, bronze mirrors etc. with numerals and trigrams are discussed here. 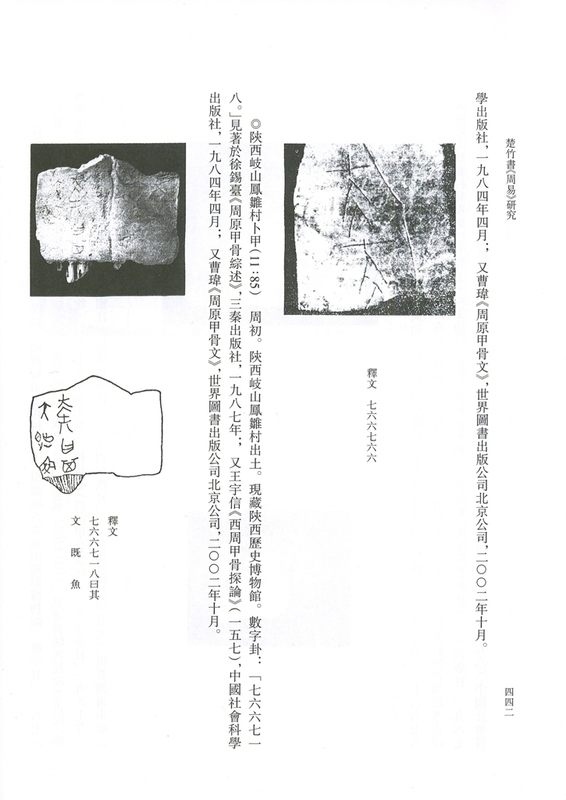 Part 4 is very interesting, as it discusses hexagrams, bagua numerals and other Yi fragments found in other Chu Jian manuscripts, like the Bao Shan Bamboo Slips. 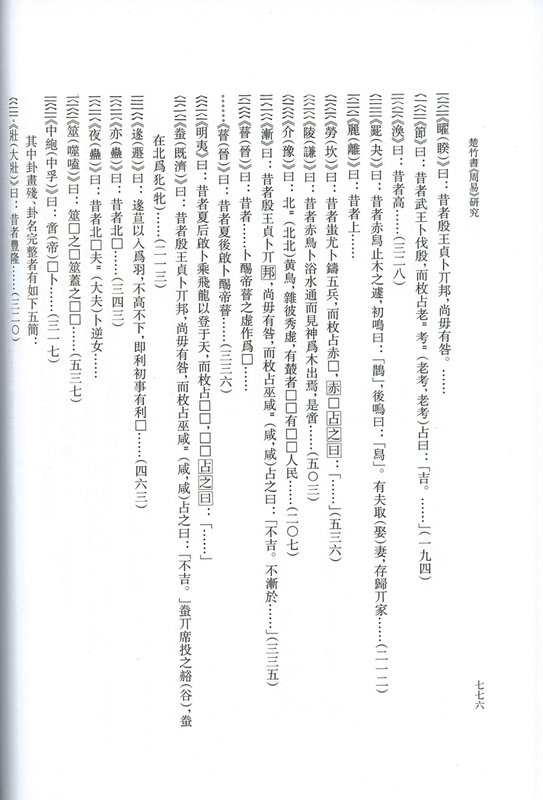 A complete transcript of the Fuyang Zhouyi. Or what is left of it. Part 5 deals with the Mawangdui Zhouyi and it's additional chapters. The parts 一, 甲 and 乙 have a transcription of the text accompanied with the original silk characters and the received text; the other chapters only have a transcription in modern characters. Part 6 deals with the Xiping Stone fragments of the Yijing. It gives rubbings of the fragments, as well as a transcription in modern characters alongside with the stone characters. This appendix deals with the Wangjiatai Guicang, it gives a transcription of its contents. Chapter 4 gives a transcription of parts from several pre-Qin and Han dynasty texts which contain references to the Yijing. Part two is an extensive list of book titles and compilations of Yijing books throughout the history of China; part three gives the received text of the Yijing. There is nothing more for me to say. All the variant text convenient together in two volumes, in excellent quality, with interesting articles added. I you have the slightest interest in the variant texts of the Yijing, then what are you waiting for. Buy this book. It is worth the money. 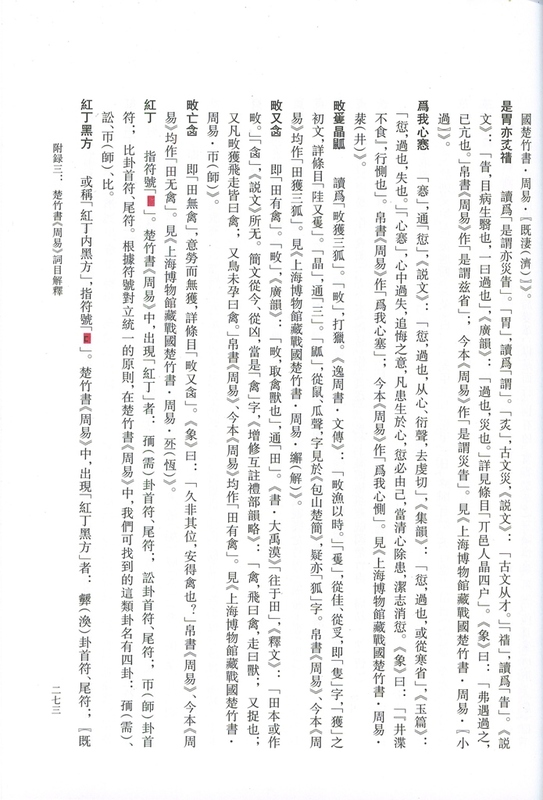 Do you have any tips on where to order this last book (楚竹書《周易》研究)? It sure seems like 'the book to have'. But i could not find it in any of the bookshops i known on the internet. I bought the book at www.frelax.com, they are not cheap but deliver fast and the price includes shipping. There are quite some Chinese stores on internet which sell this book, but most of them don't ship outside China, or don't accept credit cards.